The 500-mile-long Rhone-Saone river, which wends its way through Provence and the heart of French wine country before flowing into the Mediterranean near Marseilles, provides one of the world's most memorable cruise experiences. Named originally by the Celts, who called it Rodo ("that which rolls"), this mighty river starts its course in the Saint-Gotthard massif, near the Rhone Glacier in Valais, Switzerland. It eventually flows west through Lake Geneva before entering France. 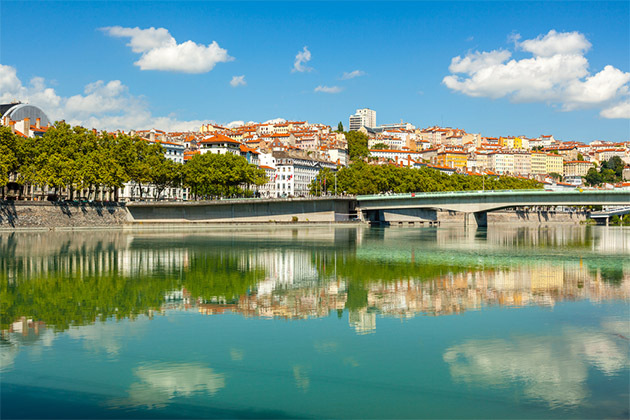 At Lyon, the Rhone and Saone rivers meet (or "kiss," as those incorrigible old romantics, the French, like to put it). But the river divides again at Arles, becoming the "Grand Rhone" and the "Petit Rhone," both of which course down to the Mediterranean via the Camargue, a spectacular river delta famed for its distinctive horses and bulls. A cruise along the stretch of navigable waters will carry you past verdant vineyards, lush olive and orange groves, and fields of fragrant purple lavender. Pack a comfortable pair of shoes. You'll need them for walking ashore. If your mobility is limited, be aware that many river stops involve climbing at least a few steps. Take a windbreaker or shawl. The chilly Mistral wind can flow through Provence even in the usually-balmy spring and autumn months, so carry an extra layer, just in case. A small umbrella often makes sense, as well. Leave room for souvenirs. This part of the world is a foodie paradise, so leave a spot in your suitcase for those must-have jars of Dijon mustard and bottles of fine French wine and cognac. You'll also find gorgeous lavender-scented, olive oil-based soaps in Provence. Take earplugs. Pack a pair to avoid being woken by rumblings as your boat makes an early morning departure from its moorings. And be prepared for calls to clear the top deck as your boat goes under low bridges.